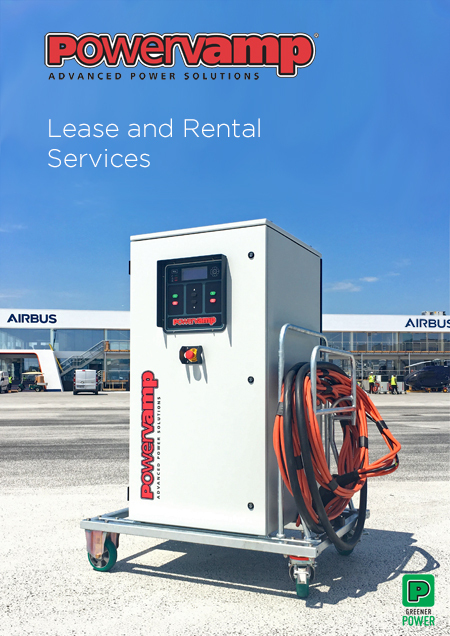 With a background of more than 25 years in the manufacture and supply of ground power systems for the aviation industry worldwide, Powervamp has steadily developed its lease and rental service business to become one of the most widely recognised suppliers of this specialised support service. Powervamp product quality and customer support is unmatched by any other service on the market and has been the key to the growth of the company, with repeat business confirming the success. The Powervamp rental fleet includes a dedicated stock of modern, silent, solid-state 28V DC power supplies, 115V 400 Hz AC 45 – 90 kVA frequency converters, TRUs, diesel hybrid power units and air-conditioning units, all of which are available for short and long-term rental contracts. Powervamp owns a huge fleet of its own designed and manufactured ground power units. Powervamp has launched a new lease and rental brochure as part of its campaign to highlight these services and to inform airports, FBOs and MROs that there are other alternatives to an outright purchase. When businesses bid for short-term contracts the operational need for portable DC power, 28V or 400Hz GPU’s for aircraft/helicopters or even portable air conditioning for aircraft can be achieved without the need of getting capital expenditure signed off. Powervamp offers its short or long-term lease/rental services to customers, through which its modern equipment can be hired by the week. Trained service staff are available to load, install and assist in power calculations when required. Leasing and renting equipment can be advantageous to a companies cash flow, as there is no immediate financial commitment at the beginning as there is with an outright purchase. This also can provide fixed financing, meaning that there is no need to worry about rising interest rates throughout the contract term. Fixed monthly payments make budgeting easier for companies which have stringent financial regulations yet also give them access to a higher standard of equipment, which might be too expensive to buy outright. Leasing/renting also guards the user against the risk of obsolescence, i.e. the risk that assets may lose their utility due to rapid changes in technology. This means that the user can adjust the term of the lease/rental such that it is no longer burdened with the assets when it is no longer efficient to operate. Air-conditioners are often used at International Airshows where ambient cockpit temperatures can soar in the midday sun. Another example of this would be to look at the flexibility of leasing/renting assets, whereby the operation need for an asset could be for a term of 6 months and the assets useful life may be 5 years. In a situation like this, purchasing the asset may not be the practical option, while leasing an asset may offer better terms for the user’s requirements. When companies bid on short term contracts, it may be a matter of urgency to require an asset, whereby leasing/renting can provide fast turnarounds times to allow quicker acquisition of goods. The new brochure outlines the available products and service that are offered within this dynamic division and is available to download now from the below link, or from our dedicated downloads section.